On my Killer and Samurai Sudoku fans Facebook page I recently asked members to post a link to this Facebook group on their walls in order to help me promote it. I also decided to award the first poster with a puzzle of their choice. Who was the first one? Well, you can have a look on the facebook page itself, but what’s more important is what kind of puzzle they chose… because that’s the puzzle that all of you are getting now. So… make sure to sign up for that facebook page if you’d like to get a chance to choose your favorite puzzle type some time. And of course share it with your friend! 🙂 Anyway… back to the puzzle… It’s a Diagonal Killer Samurai. 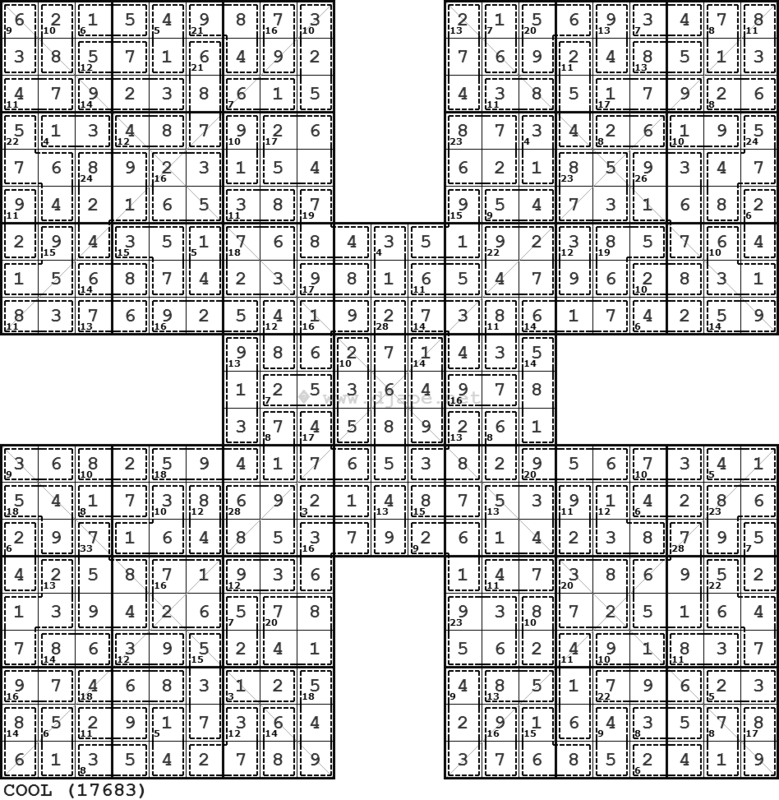 A combination of Samurai Sudoku and Killer Sudoku and of course Sudoku X. Obviously, you must follow the rules of all three of those Sudoku variants. Oh… and by the way… it’s been a while since I last published a book with these puzzles. Is it the time for a new volume? 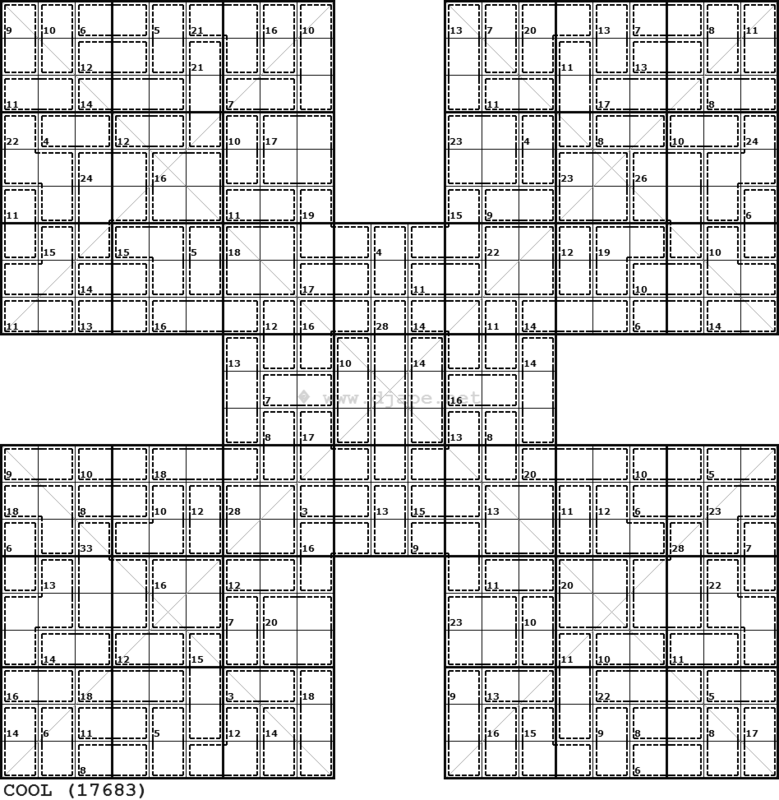 This entry was posted in Free sample puzzles, Killer Sudoku, Samurai sudoku, Sudoku Variants and tagged BOOK, COOL, Diagonal Killer, killer, Killer Samurai, Killer Samurai Sudoku, killer sudoku, rules, samurai, Samurai Sudoku, Sudoku Variant, Sudoku Variants, sudoku x, variant. Bookmark the permalink. Post a comment or leave a trackback: Trackback URL. YES! It’s time for a new volume. I buy 2, and my sister and I meet for coffee once a week to solve a puzzle and talk about life and stuff. And we just finished the last puzzle in the last book last month. YES! We need a new book!